To find out what’s new, read the change log. It’s easy to create custom providers using the API from Test.Tasty.Providers. Note on boolean options: by convention, boolean (“on/off”) options are specified using a switch on the command line, for example --quickcheck-show-replay instead of --quickcheck-show-replay=true. However, when passed via the environment, the option value needs to be True or False (case-insensitive), e.g. TASTY_QUICKCHECK_SHOW_REPLAY=true. If you’re using a non-console runner, please refer to its documentation to find out how to configure options during the run time. Tasty patterns are very powerful, but if you just want to quickly run tests containing foo somewhere in their name or in the name of an enclosing test group, you can just pass -p foo. If you need more power, or if that didn’t work as expected, read on. A pattern is an awk expression. When the expression is evaluated, the field $1 is set to the outermost test group name, $2 is set to the next test group name, and so on up to $NF, which is set to the test’s own name. The field $0 is set to all other fields concatenated using . as a separator. Timeouts can be fractional, and can be optionally followed by a suffix ms (milliseconds), s (seconds), m (minutes), or h (hours). When there’s no suffix, seconds are assumed. There may be several ways to organize your project. What follows is not Tasty’s requirements but my recommendations. test.hs is where your main function is defined. The tests may be contained in test.hs or spread across multiple modules (Mod1.hs, Mod2.hs, …) which are then imported by test.hs. If Test B depends on Test A, remember that either of the may be filtered out using the --pattern option. Collecting the dependency info happens after filtering. Therefore, if Test A is filtered out, Test B will run unconditionally, and if Test B is filtered out, it simply won’t run. Dependencies shouldn’t form a cycle, otherwise Tasty with fail with the message “Test dependencies form a loop.” A common cause of this is a test matching its own dependency pattern. Using dependencies may introduce quadratic complexity. Specifically, resolving dependencies is O(number_of_tests × number_of_dependencies), since each pattern has to be matched against each test name. 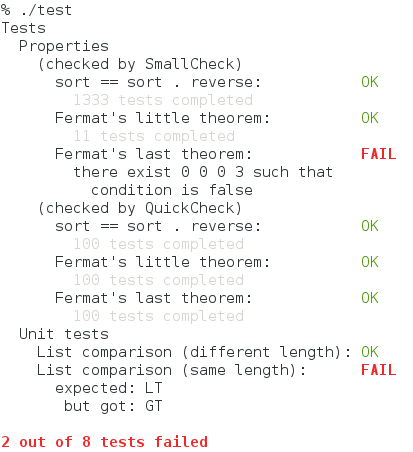 As a guideline, if you have up to 1000 tests, the overhead will be negligible, but if you have thousands of tests or more, then you probably shouldn’t have more than a few dependencies. NOTE: This major release contains some breaking changes to the semantics of patterns. In the original pattern design I didn’t notice the conflict between using / as a field separator and as the AWK syntax for pattern matching /.../. The new patterns have been around for a relatively short time (5 months), so hopefully the breakage won’t be too big. I’m sorry about any problems caused by the change. if you meant “test/group containing foo/bar in the name”. AppMonoid is renamed to Traversal for consistency with the ‘reducers’ package. Another similar wrapper, Ap, is introduced.